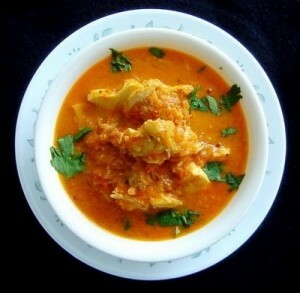 Dahi Murg recipe by Nazia Nazar at DesiRecipes.com. 1 tsp. garam masala powder. a few mint and coriander leaves chopped, some kasoori-methi . Grind together onion , ginger and green chillies to make a paste. In the dish, add 1 tbsp. oil and onion paste. Mix well. Add chicken and all other ingredients except cornflour. Mix well. Micro high uncovered 10 mins. Stir once after 5 mins. Mix cornflour in 1 tbsp. curd. Add to chicken and mix well. Micro high uncovered 23 mins. Let stand 2 mins. Sprinkle chopped mint , coriander leaves and kasoori-methi . Note : If thicker gravy is desired, increase cornflour to 2 tbsp.